The Colima volcano in western Mexico continues to surprise us. 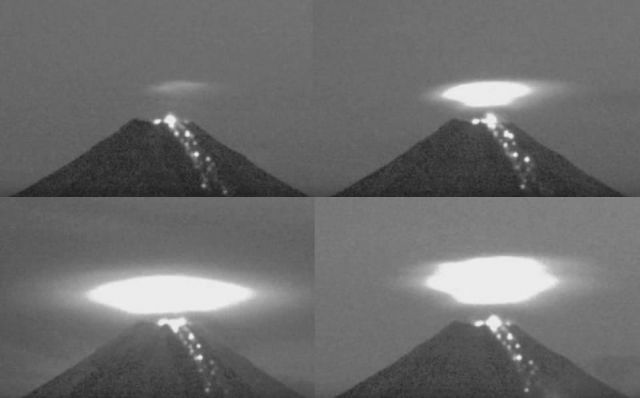 On December 2, 2016 the volcano webcam captured a strange massive Light UFO which disappears then reappears way above the summit. It looks like the visible plasma-like structure above the summit can materialize and dematerialize at will and when you think about it, it is the perfect way to cover the UFO. Notice how the UFO has no contact with the summit until the end which could be an indication that the UFO has begun to gather energy from the volcano's activities to recharge its power again. There is fog and smoke on top of the volcanos that reflect the light produced by the activity in the crater, and it expands and retracts along. that is no ufo at all, unless you really want it to be. Notice that it starts as a faded cloud. Well, there is fog or smoke around the tip of the volcano due to its activities , the light of the lava increases or decreases the reflection on the fog or cloud. No such thing as "light ufo" just a normal process of the elements that a volcano produces when is active. It seems to be to ching the tip of the volcano because at that point the eruption was bigger , that's all.